It turns out people are 3X more likely to click through an ad and 30% more likely to make purchase that offers a $5 gift card compared to $5 off. That bit of social engineering gives personalized ecommerce rewards startup ifeelgoods the potential to reinvent the concept of discounts. ifeelgoods looks at where you are on the web and matches you with a reward that you’ll value more than money. It’s been a rapid rise for ifeelgoods from its humble beginnings two short years ago. The company started by letting ecommerce shops and anyone else give away Facebook Credits as “micro-incentives” for completing calls to action or making purchases. You could get 2 Credits for signing up for an email list, 5 Credits for following the Dallas Mavericks on Twitter, or 50 for buying shoes from Shoebuy.com. This is when it discovered the perceived value gap. When it A/B tested ads for the same product hawking a $10 off vs. 100 free Facebook Credits (an equivalent value), people were much more likely to click through to grab the Credits. A small discount doesn’t trigger much emotional response, but a little gift of social game currency was much more attractive. It seems people prefer something free to something cheaper. These offers did well with people who played Facebook games because Credits were relevant to them. But what about everyone else? It needed different rewards to appeal to different customers. So it raised a $9.5 million Series A to bring it to $11 million in funding, set out on the biz dev trail, and came back with a hero’s bounty. ifeelgoods signed on some of the biggest gift card distributors, including iTunes, Amazon, Zynga, Skype, and plus top-tier app developers. Then it brought on major advertisers like Walmart, Groupon, 1-800-FLOWERS, and Coca-Cola, and built a network to match them with the reward providers. Now instead of one-size-fits-all rewards, ifeelgoods can tailor its promotional gifts to exactly what its audience wants. Shopping for t-shirts for your favorite bands? You might see an ifeelgoods ad telling you you’ll get a $10 iTunes gift card if you buy this vinyl box set. Or it could lure someone to buy a kid-friendly Xbox game by throwing in a free copy of the latest Angry Birds title where they might end up helping out the developer by making in-app purchases. A recent campaign for the film Tower Heist saw NBC Universal give away one million Facebook Credits to people who clicked on rewards buttons in Facebook ads and feed posts from Pages for the movie’s characters. 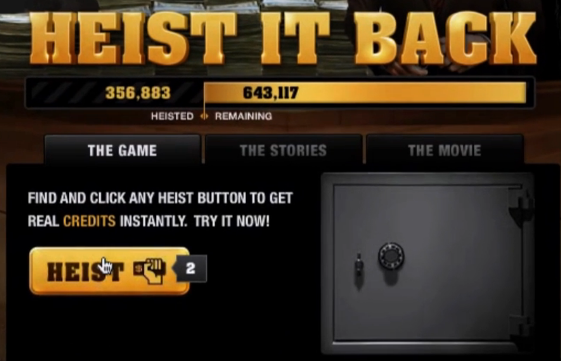 52,000 people engaged with the Heist It Back rewards game, and many invited their friends to play, score free Credits, and hear about Tower Heist. Co-founder Suchit Dash tells me “It’s not about cramming a fixed reward down the consumers’ throats. The retailer doesn’t know what someone wants as a reward. We can target consumers with the most relevant reward, like this specific game, or something they’re interested in. Or they can pick any one they want.” For example, it knows iTunes gift card offers attract more clicks when run on Apple’s iAd platform that reach Apple device users who would enjoy some extra songs or apps. It’s wins all around. Retailers / advertisers get more conversions on the things they sell, reward providers get people hooked on their marketplaces or services, users get something fun for free, and ifeelgoods earns a margin. Meanwhile, the startup’s rewards network is getting smarter and the team keeps growing. It’s got 25 employees across Silicon Valley, New York, and Paris handling its 100 advertisers and 150 reward providers.